All of the companies on the exhibitor section of our web page are bringing demo bikes for registered attendees to use. 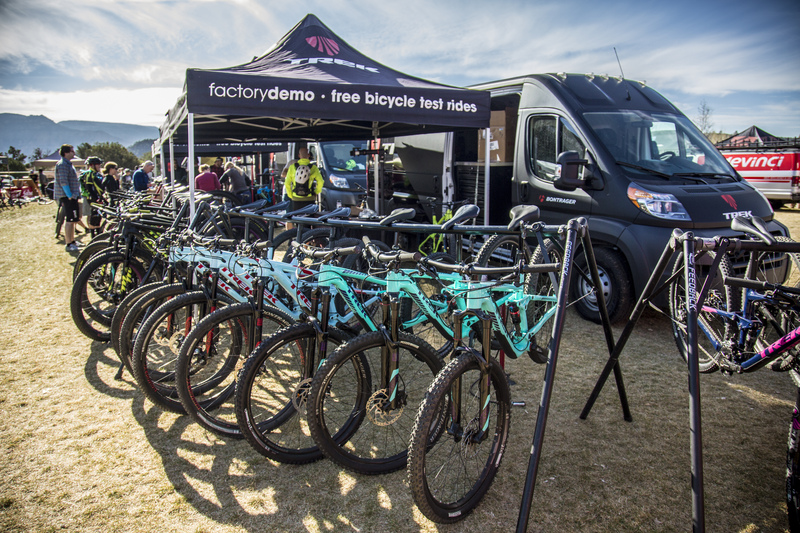 While there are a ton of bikes coming to the event they are on a first come first serve basis so if there is a particular bike that you want to try please come early. It is up to each vendor as to how long you can take a bike out on a ride however 1-2 hours is pretty common, after all we want to make sure that everyone gets to try all of the bikes. Please don”t hold onto a bike while you get lunch or take a break; return it so others have a chance to ride. Some people know that they want to go out and ride all day or know that they do not want to wait for a bike and need to be 100% sure that they have a bike ready for them each day. If this sounds like you then your best option is to rent a bike from one of the great local bike shops in town. The two bike shops in Sedona that have been working hard to bring you the Sedona Mountain Bike Festival are Over The Edge Sports and Absolute Bikes. A good attitude. Get stoked because you are in for some world class trails. A helmet, riding shoes, pedals, sunglasses, hydration (a pack or bottles), a pump, a multi-tool, a tube, and any of the other things that you would normally ride with.